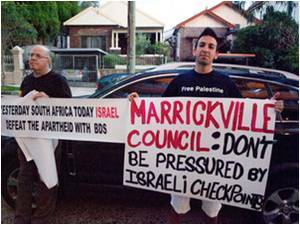 Last night (19 April, 2011) the Council Chamber at Marrickville was packed and overflowing with BDS supporters (also a small number of people opposed to BDS). Thank you to all our supporters who turned out in such amazing numbers! A big thankyou as well to Council staff for arranging to broadcast the debate into two other rooms so everyone could hear. There were 3 hours of debate, wonderful contributions from the community and some councillors, speeches which we will publish here soon. 2. Remains concerned about Palestinian human rights and calls on Israel to end the occupation of all Arab lands and dismantle the Wall; ensure the fundamental rights of Palestinians to full equality; and respect, protect and promote the rights of Palestinian refugees to return to their homes and properties. Although Council is for the time being unable to continue formal support for BDS, there are many of us in the community to continue the struggle until apartheid is dead in Israel and it is a democracy for all its citizens. People in Palestine heard about your efforts and you have educated folks all over Sydney, Australia elsewhere on the planet about BDS; so in this dance once step forward then one step back but the music goes on. I deeply admire and respect the outstanding courage, compassion and moral sense your pro-BDS supporters have shown the world. The NSW premier and the media pundits are, sadly, lacking in that moral sense. They have publicly declared that local bodies should restrict themselves to rubbish, rates and roads. By that reasoning, the BDS adopted by local governments against South Africa’s apartheid regime too was improper. Here’s what both Premier Barry O’Farrell and the media choose to ignore with regard to the BDS against apartheid South Africa : in addition to campuses, anti-apartheid activists found concerned and sympathetic legislators in cities and states. Besides advocating that institutional investors withdraw any direct investments in South African-based companies, anti-Apartheid activists also lobbied for the divestment from all U.S.-based companies having South African interests Several states and localities did pass legislation ordering the sale of such securities, most notably the city of San Francisco. The result was that “by the end of 1989 26 states, 22 counties and over 90 cities had taken some form of binding economic action against companies doing business in South Africa.” Many public pension funds connected to these local governments were legislated to disinvestment from South African companies. These local governments also exerted pressure via enacting selective purchasing policies, “whereby cities give preference in bidding on contracts for goods and services to those companies who do not do business in South Africa.” In November 1962, the United Nations General Assembly passed Resolution 1761, a non-binding resolution establishing the United Nations Special Committee against Apartheid and called for imposing economic and other sanctions on South Africa.